The purpose of the 5S Garage video is to provide the perspective necessary for your employees to truly understand the 5S method and create a visual workplace that will drive your organization to become more lean. This is the 5S Garage video with Spanish voice over. 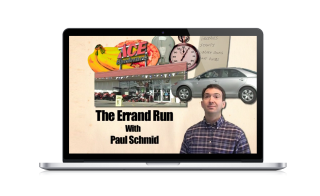 The purpose of the Errand Run video is twofold. First, get the audience thinking of their jobs in terms of a value stream. That is, a stream of activities that can be split into value adding work and nonvalue adding waste. Second, show the audience how to create value stream maps to identify and eliminate waste through continuous improvement. After viewing the 5S Garage video we decided to make it a core element of our in-house training for 5S. Because everyone relates to a garage, it makes the understanding of the principles easy to follow. The video also has “staying power” in that months later, employees are still referencing specific things they saw in the video. Overall, well worth the purchase price. 5S Garage enabled me to show the basic Lean Principles that our employees needed regarding the 5S’s. The video is a perfect length of time and is presented professionally. I would highly recommend 5S Garage to anyone who is introducing Lean principles to their company or who is currently in their lean journey and needs a different viewpoint given to their workforce regarding the 5S principles.